India and Russia reportedly concluded an agreement for the procurement of two guided-missile frigates for the Indian Navy. India and Russia signed a contract for the procurement of two Admiral Grigorovich-class (Project 11356) guided-missile frigates destined for service in the Indian Navy earlier this month, according to Indian media reports. “Sources told [The Economic Times] that while final clearances for the long-pending project came before the summit earlier this month between President Vladimir Putin and Prime Minister Narendra Modi, the deal was signed last week after price negotiations,” The Economic Times reported on October 29. A follow-on contract for the construction of two additional Admiral Grigorovich-class frigates is expected to be signed in the near future. Notably, neither India nor Russia officially confirmed the signing of any agreement. The two Admiral Grigorovich frigates destined for the Indian Navy will be constructed at Russia’s Yantar Shipyard on the Baltic coast. Should New Delhi and Moscow conclude a follow-up order, the remaining two ships of the class will likely be assembled at India’s state-owned Goa shipyard. The 3,620-ton Admiral Grigorovich-class is an upgraded variant of the six Talwar-class frigates that Russia built for the Indian Navy between 2003 and 2013. The warships are capable of reaching top speeds of 30 knots, have an endurance of around 30 days, and deployed for a wide range of operations including anti-surface warfare, anti-submarine warfare, and anti-air warfare missions. The warships can be can be armed with the BrahMos cruise missile system fired from an eight-cell 3S-14E under-deck launcher, next to a range of other weapons systems. The frigate class also features a flight deck to carry a helicopter for anti-submarine warfare missions. India and Russia signed an inter-governmental agreement for three Admiral Grigorovich-class guided-missile frigates in 2016. 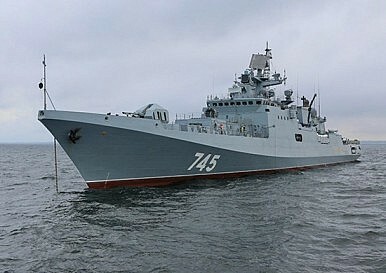 The three frigates were laid down in Kaliningrad in 2013 and originally destined for the Russian Navy’s Black Sea Fleet. The ships of the Admiral Grigorovich-class are powered by M90FR gas turbines designed and built by Zorya-Mashproekt in Ukraine, Russia’s principal surface ship-builder since Soviet days. Russia acquired three M90FR gas turbines before the export ban came into effect, which have been installed on the first three Admiral Grigorovich-class ships to be commissioned by the end of the year. The Russian defense industry is in the process of designing an indigenous replacement for the Ukraine-made turbine engine. Moscow awarded a contract to NPO Saturn, a Russian aircraft engine manufacturer. (…) analysts believe that a new propulsion system will not be ready for the navy before 2019-2020. India will also likely purchase the turbine engines directly from Ukraine. As I noted earlier this year, it appears that the three hulls currently under construction in Kaliningrad will not be used for the future Indian Navy frigates and are still destined for service in the Russian Navy. News of the frigate deal comes at a time of increased scrutiny of India-Russia defense ties by the United States over India’s purchase of Russian-made S-400 air defense systems. Washington has threatened to impose economic sanctions on countries engaging in “significant transactions” (defined as above $15 million) with the Russian defense industry under U.S. legislation known as the Countering America’s Adversaries Through Sanctions Act (CAATSA). India and Russia signed an inter-governmental agreement for two guided-missile frigates on January 30.